Digital mapping and internet map services have brought us many advantages – no matter if we plan a shopping trip to a close city or a vacation on an island in the Mediterranean, we have maps immediately available that usually by far exceed older pre-digital products in terms of precision, detail and actuality. The shiny new world however often comes to abrupt end when we leave the realms of civilization and look into the more remote regions of the planet. 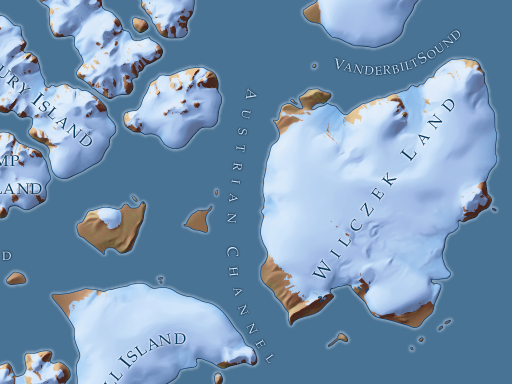 Franz Josef Land is a good example to illustrate this – no matter if you look at commercial or non-commercial map services maps of the islands are essentially empty usually containing nothing more than a coarse coastline. Openstreetmap was comparatively good with quite a lot of islands and landmarks labeled at least in Russian. I have meanwhile entered much of the data I produced for the map I introduce here in Openstreetmap so you will find better quality in many OSM based services now. Satellite image layers are also coarse and patchy at best. The reason for this is not that remote sensing data is not available for these regions – there are some restrictions due to the high latitude but nearly all commercial and government operated high resolution satellites cover the area. The real reason is that map producers today focus their effort strongly on the areas of highest interest. And this in a way becomes a self fulfilling prophecy. When Google etc. analyze use of their services they will certainly see that the number of views of an area like Franz Josef Land is hardly measurable in comparison to high interest areas. This is partly due to genuine differences in the interests of the user but partly also because there is nothing to see in those areas of those maps – hence no one looks there. And although it would technically be no problem for satellite operators to schedule acquisitions in remote regions it makes much more sense economically to use scarce acquisition time to update two year old high quality coverage in central Europe than to update ten year old and much lower quality data at the end of the world. As a result of this 30-50 year old Soviet maps and sometimes even the average 1980s world atlas have a better coverage of the islands than current map services. The map I introduce here is meant to fill this gap for Franz Josef Land – but this is of course only one out of many neglected areas so I hope this also serves as an incentive to others for looking into unknown corners of the planet. Mapping is based on Landsat images – mostly from since 2006 but in parts also older. Until Landsat 8 acquisition schedules did not usually include August in this area which is not ideal. 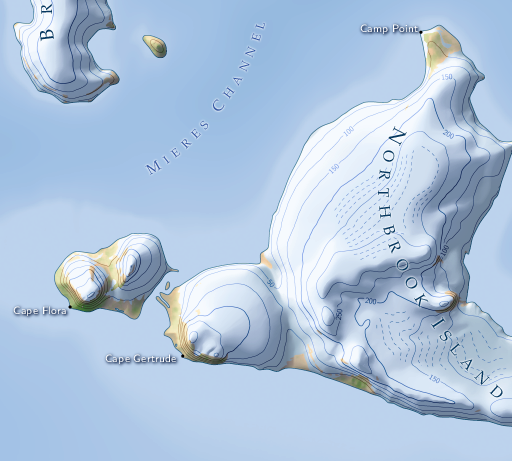 There are two map styles available – a dark and a bright one which are generated using the same rendering techniques already used in the generalization demo map. Label placement still has some flaws that can be seen in a few places, mostly with the straits and bays. 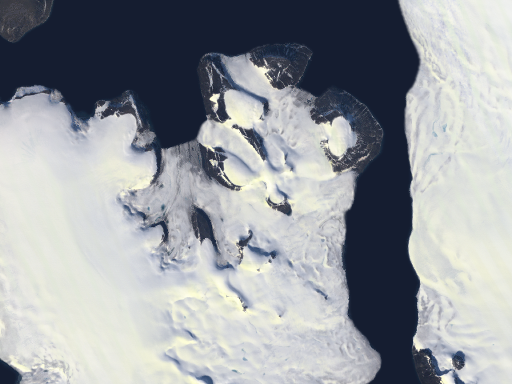 The most difficult part of the map was relief rendering since the elevation data is much older than the satellite images and since ice covers most of the islands and the ice is constantly changing this generates significant mismatches. Relief data is also not very detailed so the highest zoom level stretches the limits quite a bit. There is also a satellite image layer that can be viewed. This is based on an image mosaic I of course primarily produced for rendering 3d views. Assembling satellite images into a seamless mosaic comes with several additional difficulties in the high Arctic. There is for example quite visible striping on the ice caps in some areas since the satellites clip measured intensity in the bright areas and this clipping happens at a different intensity for each of the satellites. You will also see some striping in ice free areas were not enough good quality snow free imagery from late summer was available. Assembling the mosaic is done in an automated process although the cloud masking required as a preprocessing step has been done by hand (distinguishing clouds from snow in the images is another special difficulty of polar regions). So if you like to browse a part of the world vigorously neglected by the major map services have a look. I really like your map. It looks great. Not all OSM-based maps are essentially empty as you have written above. What kind of software have you used for map rendering? Would it be possible to get a downloadable version of your map. will be visiting Franz Josef land next September and very unlikely to have fast (or any :-)) internet connection. No, i don’t offer any offline versions of any of these maps. The number of users interested in that is simply too small justify the time necessary.